Mike Ladd : rap, slam // Ibrahima Diassé : tassou , tama (drums) // Hubert Dupont : electric bass and compositions // Hervé Samb : acoustic guitar // Naïssam Jalal : flute // Maxime Zampieri : drums // Djengo Hartlap : live sound design. Here is an encounter between Mike Ladd’s spoken word and its traditional Senegalese version : the “tassou”, sung by Ibrahima Diasse. This vocal meeting is organized by Hubert Dupont, a musician and composer who knows how to deal with African musics without denying his own universe. Bassist, double-bassist and composer, he is better known on Jazz and improvised music planet. 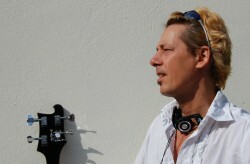 He is stubborn in his musical approach as well as ready to try any style. Born in Boston, he used to live in NYC for long time. He is living now in Paris and spreads his spoken word everywhere. With Vijay Iver he released In What Language and then Still Life with Commentator. He also wrote and produced ten albums (The Infesticons, the Majesticons, Negrophilia, Nostalgialator). He is a master about black literary and artistic movements. His words are engaged and with him the reaity is stranger than fiction. On stage, we meet a charming personality. 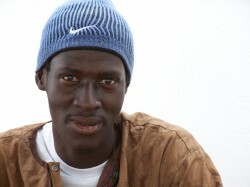 This big man is probably the best “tama” player in Saint-Louis, Senegal. This little drum has a real role in “sabar” bands. By singing traditional songs, he shows that he know how to rap.